Republican District 140 State Representative candidate John Flynn speaks at last week’s Norwalk Housing Authority town hall in South Norwalk. Updated, 6:19 a.m.: Copy edits, information added. NORWALK, Conn. – John Flynn, the Republican candidate for District 140 State Representative, has a multi-year history of allegations, including multiple unsuccessful lawsuits in which he represented himself. Claims by Flynn include an assertion that Stamford Police facilitated a murder for hire scheme against him and that Norwalk Police are helping to cover up 300,000 felonies. He has also alleged in court actions that police sent an “informant” to have him killed, and that police sent an off-duty officer to shoot him. Nine out of ten lawsuits have been unsuccessful; one is in process. Flynn says his lawsuits have been dismissed because Gov. Dannel Malloy appointed the presiding judges. He also says Malloy ordered a hit against him, when he was Stamford’s Mayor. Flynn is running in the heavily Democratic district against Common Council member Travis Simms (D-District B), the Democratic candidate, and Human Relations Commissioner Colin Hosten, a Democrat endorsed by the Working Families Party. Flynn v Scaramela Dec. 12, 2010, unanimous jury verdict for defendants Aug. 1, 2014, judge Kenneth Povadator, appeal dismissed Dec. 9 2015. Flynn’s 122-count lawsuit against Firetree and Rilling recounts claims in previous lawsuits and elaborates on Norwalk’s role. “Police sent an off-duty officer (Lesa Scarmella) to Plaintiff’s office to shoot Flynn on 6/22/10. Rilling in July moved to dismiss the case. 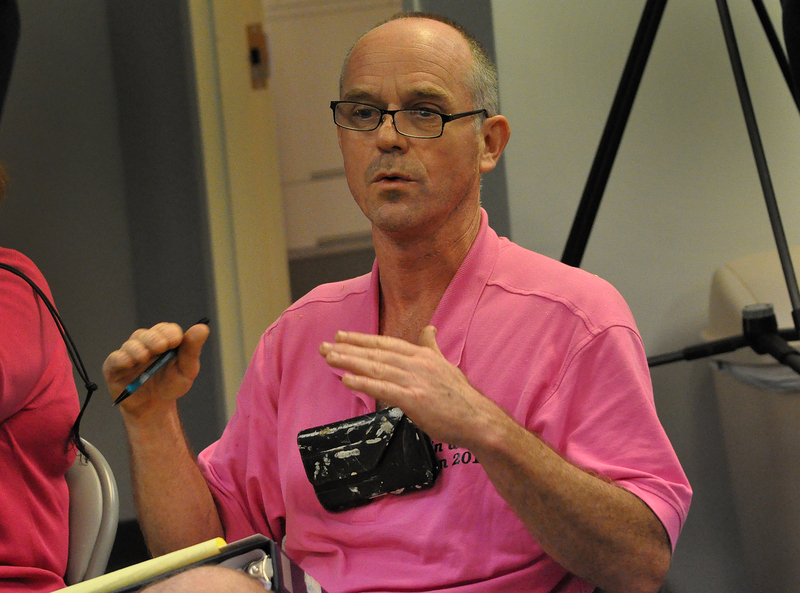 Assistant Corporation Counsel Brian McCann wrote that the court has no jurisdiction and the “case is not ripe,” as the Zoning Board of Appeals denied Firetree’s application to open its residential re-entry center at 17 Quintard Avenue and the facility is not operating. He had subpoenaed the 911 records but hadn’t gotten them, he said. Flynn in the 2014 case versus Norwalk alleged that lawyers “cashed stolen GGLP checks and orchestrated a money-laundering scheme” through his financial firm. “Norwalk officials allowed Attorneys to Bank America, Fleet Bank, U.S. Clearing and others to stalk the Plaintiffs son and refused to make an arrest. Norwalk Officials knew the Plaintiffs son was told that he would be killed. No arrest was made,” Flynn wrote. Flynn’s complaints of securities fraud and money laundering are based on a mistaken impression that he retained ownership of financial firm after resigning from all positions of employment in the firm and withdrawing as its limited partner, Judge Irene Jacobs wrote in 2014. Flynn was arrested in 2011 for making harassing phone calls to the Stamford Mayor and Stamford Police Chief, and pled guilty, Jacobs wrote. 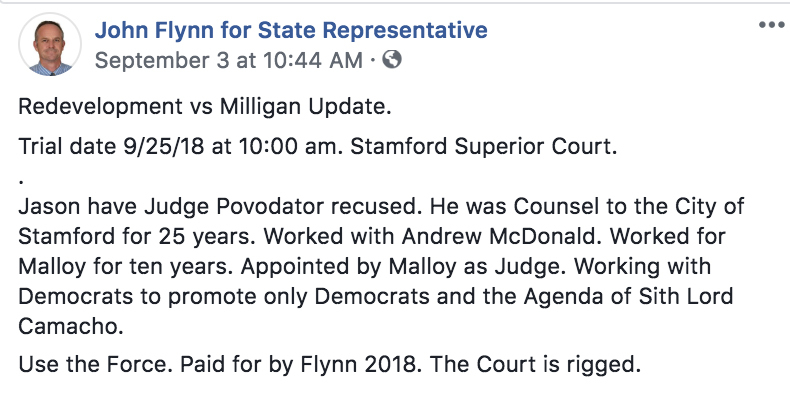 She went on to explain that Flynn’s allegation that Malloy had falsified an arrest warrant was invalid since Malloy was governor, not Stamford Mayor, at the time. Flynn presented no evidence that Malloy had falsified the warrant, she wrote. “My entire platform for running for the 140 is: Due Process and Equal Protection. “Troop H of the State Department of Public Safety/ Division of State Police Central District Major Crime Squad and Troop G Bridgeport. “I have been sending the State Police documents for more than 15 years of financial crimes. The State’s Attorney of Hartford, Norwalk, Stamford, and Bridgeport were notified many times. 300,000 felonies were reported. What happened? Flynn has not applied for Citizens’ Election Program funding, according to the Secretary of State’s website. “John’s our endorsed candidate,” Republican Town Committee Chairman Mark Suda, a Norwalk Police officer, said on Sept. 6. “I wish him the best. I hope he wins.” Suda declined to comment further on Flynn and his candidacy when contacted recently by NancyOnNorwalk. Hosten is not a United States citizen, Flynn has said multiple times. “I have told you repeatedly to check the voter rolls. Colin is an American citizen,” Hosten supporter Anna Duleep replied on Flynn’s Facebook page, on Aug. 24. “The voter rolls means nothing if he falsified that as well. are you his attorney? Have his attorney call me,” Flynn replied. “John, as Town Clerk I can verify that Mr. Hosten is an American citizen,” Town Clerk Rick McQuaid, a Republican, replied. “Colin Hosten registered to vote in Norwalk in 2017. The application form requires him to state under penalty of perjury that he is a U.S. Citizen,” Democratic Registrar Stuart Wells said in a Monday email to NancyOnNorwalk. NancyOnNorwalk asked Hosten if there was a reason why Flynn thinks he’s a citizen of Trinidad. Hosten’s parents were career teachers in Trinidad, he has said. He moved to Brooklyn in 2004. Flynn on Thursday said on Facebook that Hosten had bowed out of the race. Not true, Hosten said in an email to NancyOnNorwalk. Simms did not reply to an email seeking a response. Earlier that day, NancyOnNorwalk asked Rilling about other comments made by Flynn. “I’m on vacation for the next week. I will have no comment about Mr Flynn’s ramblings. I will let them speak for themselves,” Rilling replied. One of Flynn’s campaign issues is Firetree, which sought to open a federal prisoner halfway house on Quintard Avenue, down the block from Flynn. “Kulhawik was on the Board of Firetree, they are under indictment in PA for money laundering. “He threatened me with arrest. I called Internal affairs multiple times a long time ago. What is the outcome? “What is the outcome of the 300,000 felonies I reported multiple times? “I gave you the benefit of the doubt any times. We are out of time. “The Police are walking around town telling my supporters many things. They are on the clock. That’s my dime. NancyOnNorwalk forwarded the email to Norwalk Police Chief Thomas Kulhawik and asked for a response. He did not reply. Flynn has also accused Democratic Town Committee Chairman Ed Camacho of ethics violations with Firetree. “Ed Camacho worked for the prison release of inmates from Albany, as Counsel to Parole for the for-profit privately owned Prisons,” Flynn wrote on Facebook in August. Flynn filed a lawsuit against Firetree and Mayor Harry Rilling last year, alleging that the value of Quintard Avenue homes had plummeted 80 percent since Firetree’s attempt to open a federal prisoner halfway house there had become public. “Plaintiff Flynn was never notified by anyone of Firetree’s intentions. The Plaintiff discovered Firetree LTD, when human feces from the workmen were found behind the plaintiffs garage. Norwlak Police refused to document the incident. Demonstrating collusion,” one of the complaint’s 122 paragraphs states. Excellent reporting and recap but I stopped reading after about the 3rd paragraph and scanned the rest. Simms vs. Flynn…..what a Flyweight Match that will be. By the way, are John Flynn and Scott P. Merrell roommates in town? There is nothing more I hate in this world than people who abuse the judicial system. This guy sounds “off” (in order not to violate NON guidelines). Paging Nurse Ratched. Nancy have I told you just how beautiful you are to me? This thing you wrote, a portion has been taken out of context because I am all over the place, not you, and could use many corrections. First of all there are 250 other cases. 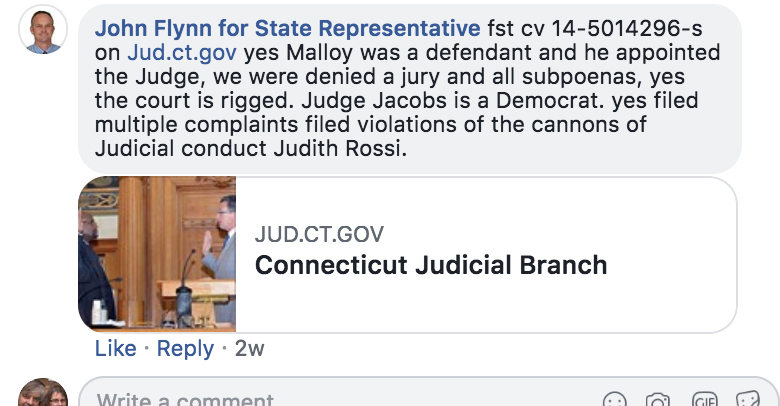 Yes Provodator, Heller, Jacobs, Underhill, Adams, are all Democrat Judges appointed by Malloy, who denied me discovery 1000 times(every time). I was denied all interrogatories, all requests for production, all subpoenas, all depositions, all appeals. I was denied all admissions and almost all evidence. I can live with the consequences. My people know me well. These Judges hate me. They should be disbarred. I have claimed conflict of interest 200 times. How can a judge rule in a case where they were appointed by the defendant? I’m not crazy. I am a patriot. The court is rigged. Fix it. No more door knocking, its too risky now. A few comments. I am super conservative. Nancy is super liberal. Fine I trust her. She reminds me of my favorite Aunt. We agree to disagree. 1) Jason Milligan. Povodator is your Judge; he was Counsel to the City of Stamford for 25 years. He worked for Malloy for ten years. First he will give you colonoscopy, then vasectomy, then you will be the first living heart donor. Ask for another Judge. He probably was steered your case. That’s how it works. 2) Ask Police Officer Cari, Zullo, Miller and Spaulding how they are doing? 5 years each. They are the subject of an East Haven sting operation by the FBI. Google the East Haven Indictment. Yes, I won but lost on paper. 3) The Governor was a defendant in FST cv 14 5014296. He appointed the Judges that heard the trial. He never testified. He gave no deposition, he was protected by a protection racket. The Police refused all subpoenas signed by Judge Povodator. The Police Chief was Chief Larrabee, Chief in Stamford who also worked for Mayor Malloy for ten years. I didn’t lose, I won. 4)I now have over forty 911 calls from 6/27/10. Denied at trial. Who ever heard of a Police misconduct case where the Police turned over the incriminating evidence? 5) If you read the Detective Maloney evidence, which I have there is no question, that civil rights issues were violated. Detectives that fabricate evidence are dangerous: they can give you the death penalty. 6) There is a long list of Police complaints in Norwalk that will never be addressed. The police openly talk about it in e-mails. Complaints that will never be investigated. Thank god I can prove it. Police decide who to prosecute and and when to look the other way. It is called a discretionary act; they have immunity for discretionary acts. Perjury is quite different. Stay tuned. I have lost a few chess pieces; but it is checkmate in two. Thank you Nancy. As for the election, I may not win every battle but I will win the war. Is it just me, or does Connecticut have the worst hit men ever? Nancy did a ton of work here. Look at the 14th link. Firetree answer to motion to dismiss. Rilling and Rochford made false statements in the answer and their affidavits. The place was abandoned, so after a year it returned to the prior use. read the links she provided. she is leaving breadcrumbs and you should follow them. They issued a permit on 5/11/18. In July they said they issued no permits of any kind. Its perjury by your mayor. Brian McCann lied repeatedly to a Judge. Silence Dogood. You sent a email from an IP address. Piece of cake. Thank you Nancy. Again 14 times. This comment has been disallowed for making unsubstantiated allegation of criminality. Anyone with a news tip may e-mail [email protected]. Am I in the minority here by thinking this is one of the oddest pieces of reporting in the history of reporting? The RTC endorses this candidate? Link 10 Flynn vs Computershare: Nancy left more breadcrumbs, and did a lot of work. Paragraphs 90,98, 99,88,111,114,126,127,12, etc. 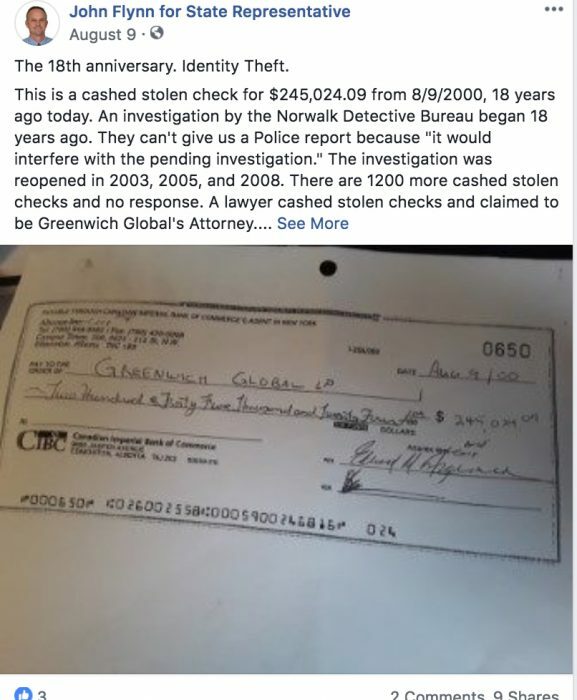 detail the actions of the Norwalk Police Detective bureau as it relates to the theft of 250,000 shares of Altarex, 250,000 shares of Virexx, 250,000 Paladin labs, 250,000 Knight Pharmaceutical, 6,000 NASDAQ, 10,000 Sheffield and hundreds of other securities. Kevin Kane made a comment above. Kevin Kane is the Chief’s State’s Attorney. Who assigned Richard Colangelo, States Attorney to investigate these claims 5 times. Colangelo did not do his job and suppressed evidence of 300,000 felonies. State’s Attorney of Norwlak was also assigned and they can’t find any file. This is the largest securities fraud case in Ct history and Kevin Kane commented right above my comment. He and his staff knowingly suppressed evidence that I sent him. Kevin Kane, Chief State’s Attorney, could have prevented hundreds of thousands of felonies. Kevin Kane, Chief State’s Attorney read three paragraphs and stopped. Kevin Kane is the State’s Chief law enforcement officer. He is the Divisional Head of the Criminal Justice Office. Tom Carson was notified more than ten times of the murder for hire, money laundering, extortion, etc. His phone number is 860-947-1101 They are located at Us Attorney’s Office 450 Main Street room 328 Hartford Ct 06103 fax 860-760-7979. Nancy listed actual court cases and many of the complaints filed as they relate to check fraud, wire fraud, securities fraud, accounting fraud, identity theft (racketeering). Approximately 2 million Select Therapeutics is missing. 16 accounts are missing. Paladin was $150 per share. REGN was $600 per share 8,000 shares are missing. I bought them at $20. Many different accounts are missing. Mayor Rilling claimed in the attached video these items were investigated. The fact is, the Detectives testified they never investigated, after the Chief of Police instructed them to investigate. This is not a discretionary act. This is a direct order. This is a breach in the chain of command. Bujji you don’t get out much do you ? Mitch you asked about the water. Spoiler Alert to the Republican-Endorsed State Representative Candidate John Flynn- It’s NOT the same Kevin Kane. I’d still vote for John Flynn over Travis Simms. Travis will do absolutely nothing and John Flynn…. I can’t even speculate what he will do but I’m sure it will keep folks on their toes! republican party endorses this guy? Doesn’t say much for them. feel bad for the people of that district. I have no sympathy for people that clog up the courts with this type of rhetoric. of that district says a lot , tonight the homeless shelter became filled from off the street it got cold , its a sad picture I have to paint. While some cant fathom what goes on in our district when it gets cold we know it as a way of life. Children are homeless also , the courts are full of this rhetoric as well. Doesn’t say much for those in Norwalk that are oblivious. Feeling bad for the right people would be a good start. Rolling Ridge Condominium residents clogged the courts and lost Friday big development on main ave is a go , but I doubt if our district feels that way. Im not defending anyone nor do I pass judgement unless I know all the facts. Hey Norwalk its time to think about the Homeless the mall isn’t done yet.